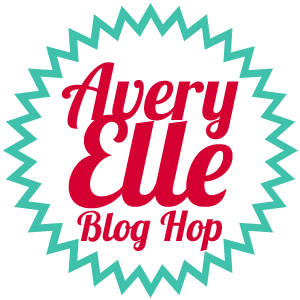 I'm so excited to be here with the new Avery Elle Fall release! All the new goodies are available on the Avery Elle website now! There are so many fun new stamps and dies, you need to check it out! For my projects today, I'm using the new set I designed called Penguin Greetings. It's a mini 3"X4" stamp set and a separate set of coordinating dies. The stamp set features a family of penguins that you can mix and match for all kinds of cards. My first card uses the largest of the penguin stamps with the coordinating "warm" word die. I made a frame using the Double Pierced Circle dies and added some patterned paper for my background. This next card uses one of the smaller penguins in the set with the snowboard die. I created my snowy hill with the arc die from the Custom Panels die set. To get that chevron pattern I used one of the stamps in the Rounded Diamonds set. Here's a close up of the die cut penguin on his snowboard. I really love the smaller scale of these stamps! So cute! Now are you ready for a giveaway? 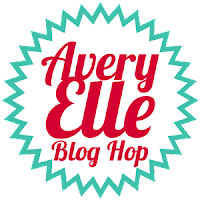 To celebrate our Fall 2015 Release Blog Hop, Avery Elle is giving away a $25 Gift Certificate to one random winner. To enter to win just comment on this post. There is no purchase necessary and you must be 18 years of age or older to enter. This giveaway is void where prohibited. You can also do options 2, 3, 4, 5 or all 6 of the following to increase your chances of winning. You have until midnight Sunday, September 6th to enter. The winner will be announced on the Avery Elle Blog on Monday, September 7th . All products are available for purchase in the Avery Elle store right now. The reindeer on that sweater is so cute. Love the card! So cute, JJ. I love that little snowboarder. So so super cute!!!! I love it so I had to order it!!!! Darling cards & the penguins on in this set is so stinkin cute! Awww...those penguins are so super duper cute and fun!!! Awesome cards! Great work on those clouds!! I adore the penguins. The sweater is cute! SO are the cards. Oh that snowboarding penguin is adorable!!!! I just love the snowboard penguin, really very cute! JJ your penguin cards are so cute! 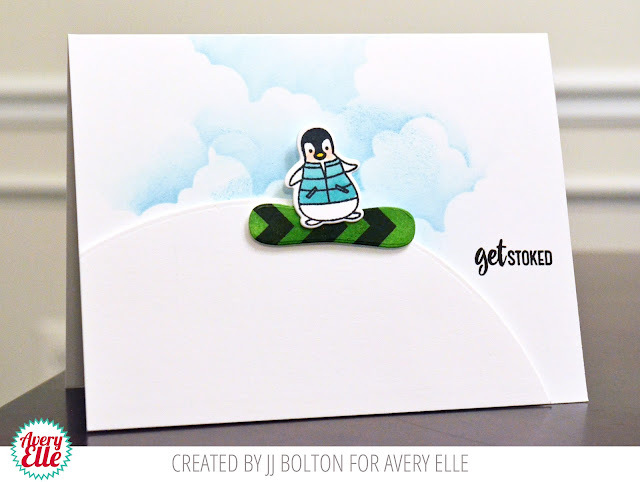 I love the scene you created with the penguin snowboarding...awesome! Love your cards! Your clouds are spectacular! Thanks for sharing! The penguin cards are so cute. Darling cards! That's a pretty steep hill for Mr. Snowboarder! Thanks so much. Adorable cards with your super-cute designs! Great cards! Especially love the penguin in the red sweater. adorable as always :D love these. Two really adorable cards, JJ! I love how you colored the penguins, and of course your cloudy sky is just perfect! I love your penguins JJ! The snowboarder is so cute, I love his vest! What a cute and super sweet cards! Love the Penguin Greeting set! Congrats, JJ! I love your fun cards! This is so adorable!!! I love the coloring!! Those penguins are so adorable! love the cards. Your coloring is awesome! Super cute cards! I just love the little penguins and the penguin on the snowboard is my favorite! Great card for a snowboarder. those little penguins are just too adorable!! fun cards! These are both cute and I especially love the double stitched circle die. Love the penguin set you designed! Such a fun penguin- I can see lots of cute projects using this set! These penguin are really cute on your neat cards. I think penguins are all the rage and yours are sure cute! Super cute cards. I love those penguins! Love these penguins and their little outfits! Really sweet cards! J.J., your sweater penguin made me smile in a big way! SO cute! Beautiful colors too! That penguins a cutie! Great inking on your clouds! Sooooo darn cute little penguins and what a creative designing! Great variation of cloud background and love that scene you have created for the snowboard!!! Love the outfits on the penguins. Adorable penguins and love their sweaters. I follow AE via email. I joined the AE flickr group. 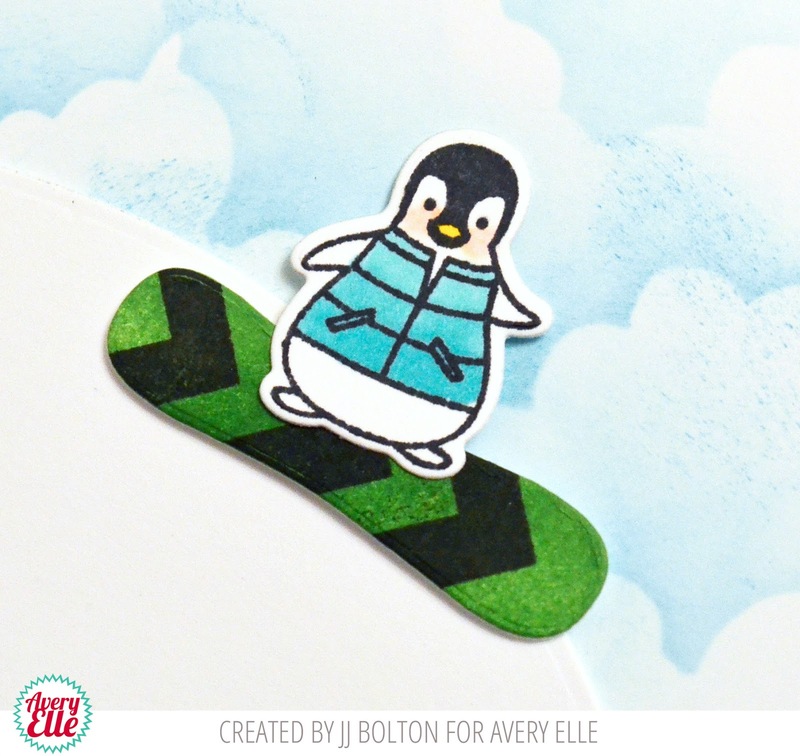 These little penguins are adorable & I love the snowboard! Great cards! Very cute penguin cards. I like the circle frame on the first one. Your penguins are seriously way tooooo cute! Adorable showcases! What fun and VERY cool cards - love them!!! The pehquins in their outfits and sports equipment are wonderful! Those penguins are super cute! Sweaters and snow board sooo. Ute! I LOVE the penquin! Super cute cards!! !